On 6 April Sophia was invited back to the Northside Produce Market by Lisa MacDonald, the Northside Produce Market Coordinator. Theme for the day was - A Sustainable Future. Sophia was able to interact and support Better Business Partnership with their stall on the day. She was active in handing out reusable cloth bags to market attendees. The market is looking to be single use plastic free by 2020. Sophia was honoured to be invited to be a guest speaker at the Ocean Lovers Festival Talks at the Bondi Pavilion. She spoke passionately about how we need to BYO and reduce, refuse or recycle our waste. The event was hosted by AustralianEthical ae Investments and MC was Leah Willis, Head of Client Relationships ae. Monday 15 April Sophia was live on television, Channel 7 Daily Edition. Producer of the show, Emily Costello invited her to be interviewed by the hosts, Sally Obermeder and Ryan Phelan on her enviro quest. Such a good interview promoting Sophia’s cause of living a plastic free lifestyle. Well Sophia made front page of North Shore Times and Mosman Daily, nicknamed Waste Warrior. Inside the paper, the feature article (Thursday 28 February 2019 edition) emphasises Sophia’s efforts to educate the general public on the problems of plastic pollution and how she mobilised others to obtain hard copy signatures for a NSW Government petition to ban plastic bags in NSW (the only State in Australia that has not banned plastic bags). She has commenced speaking at different forums kickstarted by Australian Geographic award winners roadshow late February. In her talks she takes the opportunity to be able to advise audiences of the life cycle of a plastic bottle and how only 12% of the bottles are recycled, the rest end up in landfill and our oceans. 3 March Clean Up Australia Day: Sophia joined in with the Surfrider Foundation ‘Paddle Out’ event commemorating 30 years since Ian Kiernan founded Clean Up Australia: 1989 -2019. Surfrider was able to film the ‘Paddle Out’ using a drone. The event was held at Sydney Harbour entering from Man of War jetty beside Sydney Opera House. 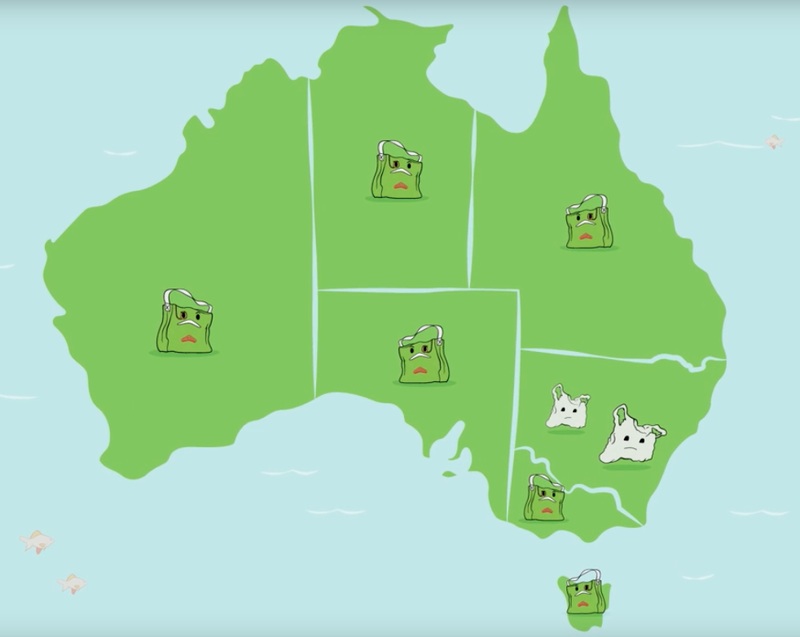 15 March: Students across Australia took part in a day of global action to protest inaction on climate change with more than 90 countries participating. Sophia was an enthusiastic supporter attending the Climate Strike rally at Sydney Town Hall with tens of thousands protesting. 20 February: Sophia was a speaker at the inaugural awardees Australian Geographic roadshow (hosted by AG Presents) - she was able to talk on her mission which is to make others aware of the impact of plastic pollution The event was held at NSW Teachers Federation Conference Centre, Surry Hills with the theme of: Perspectives of Antartica. At lunchtime she was a guest speaker at the inaugural 2019 Stead Memorial Environmental Lecture held at NSW Parliament House. She had the opportunity to co-speak with Bob Carr, the longest continuously serving Premier in NSW history (1995-2005). The theme for the event was ‘One person can make a difference’, in memory of David G. Stead. 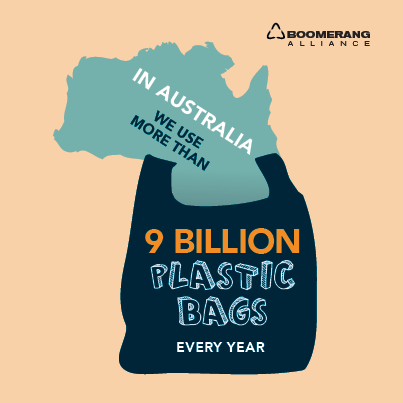 Better Business Partnerships have also released videos that they produced about Sophia’s quest to mobilise signatures for her petition to ban plastic bags in NSW. The videos have been shared with aligned NSW state politicians and social media. Australia Day, Saturday January 26 was extra special as Sophia was awarded Young Citizen of the Year by both Willoughby City Council and North Sydney Councils. 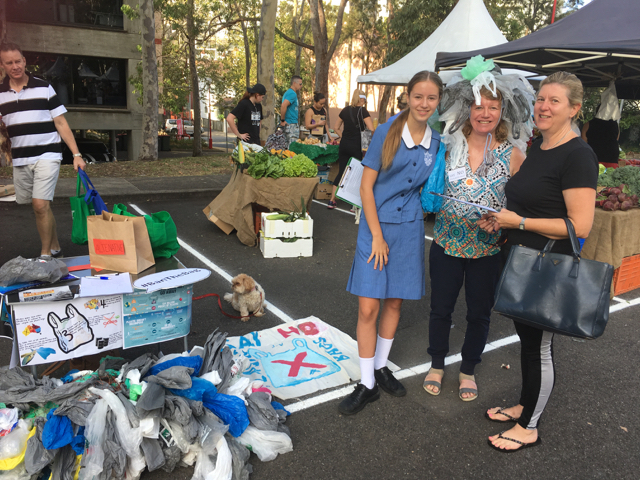 Both Councils recognised Sophia’s efforts to mobilise 12,000 plus handwritten signatures for a NSW Government petition for legislation to ban plastic bags in NSW. She was able to celebrate with distinguished guests, family and friends at both events. Sophia conducted a Waste Management Audit at her school, Monte Sant’ Angelo, North Sydney campus. She and her supporters weighed 59 of the 113 bags that were collected over two days from the site. Sophia attended an exclusive private screening of The Map to Paradise hosted with support from The Wilderness Society Sydney Committee of Management. The screening was at the Guthrie Theatre, University of Technology, Sydney. The film was an adventure-filled tale about the birth of the global movement to protect the sea. Sophia attended a North Sydney Sustainability Youth Congress, cohosted by North Sydney Council and ozGREEN, held at the Coal Loader Centre for Sustainability, Waverton. Thirty six high school students from 9 different high schools came together to develop a vision and most importantly to create practical action plans to make a difference. Clean Up Australia (CEO Terrie-Ann Johnson) and Sophia led an early morning community event at Bradfield Park, North Sydney where Terri-Ann acknowledged Ian Kiernan’s passing and legacy and handed over to Sophia, one of the leaders of the new generation taking responsibility and continuing his mission..
NSW Parliament discussed Sophia’s petition @ 4.30pm. When the petition was discussed in the chamber, the NSW Government continued their stance of opposing a plastic bag ban. Afloat magazine included Sophia’s Letter to the Editor in their September issue. 1 September - BBP filmed first session @ Northside Produce markets. 8 September - Sophia is being mentored by Laura Wells, model and environmentalist. Mentor sourced from Surfrider Foundation Australia. 10 September - BBP filmed second session at home, including Sophia’s friends. 25 September - Sophia organised with the Wenona Environmental Group a screening of Blue at the Independent Cinema, North Sydney and invited Monte and Wenona school communities. 27 September - Sophia attended North Sydney Community Awards and was awarded 2018 North Sydney Young Person of the Year. 28 September - BBP filmed third session @ BBP office, Chatswood with a voice over script. In early June, Sophia sent out an update to the majority of her supporters advising them that she had just over 8,000 signatures. She still needed a couple of thousand more signatures and she would then meet with the Premier again when she obtained the 10,000 signatures. 13 August - Sophia has sought a meeting with the principal of Monte to have the Monte canteen accredited through Surfrider Foundation Australia as being plastic free. 24 August - Sophia met with the NSW Premier and whilst the Premier still did not support a ban on single use plastic bags she commented that she would be doing the same thing that Sophia is doing ‘which is educating the public’. She advised that she will be tabling the petitions in NSW Parliament for a debate as Sophia has obtained more than 10,000 signatures. Sophia attended Plastic Free July Party on 7 July, at Tonic Lane cafe, Neutral Bay. Met Jo Taranto, Director Social Enterprise, Good for the Hood who appeared on Q & A on Monday 23 July. Jo interviewed Sophia and advised Sophia about ABC Open. A contribution named Waste Warrior: Sophia was received by ABC Open. 12 July - Attended Living Plastic Free Information Stall @ Chatswood Mall. Met Hannah Pickering from The Trolley Bag Project – she runs workshops on how to make beeswax wraps. 14 July - Attended workshop promoted by North Sydney Council called Unwrapped- a Beginner’s Guide to reducing single use plastic – hosted by Sarah Tait www.wanderlightly.com. 16 July - Attended YMCA NSW Youth Parliament held at Macquarie Street, Sydney. At lunch, Sophia addressed a youth parliamentarian crowd of over a 100 about her petition to ban the plastic bag in NSW. She also attended the debating session on the Environment and Climate Change after lunch. She obtained more than 30 signatures as well as a contact for the NSW Youth Parliamentarians Environment Group, Sam Harris. 21 July, 2018 - Attended Northside Produce Markets Saturday morning. Advised about a magazine called Afloat which has a readership of over 30,000 (Australia wide). 22 July - Attended Sustainability at Stucco in Newtown – Student Climate Action Network. 28 July - Attended a Plastic Free Community event held at Barrenjoey High School, Avalon. The theme was A Living Ocean for Future Generations. There were stalls and workshops from ocean care groups. In July, Michael Paton, Youth Minister for Our Lady of the Way Parish, advised that the Parish had nominated Sophia as 2018 Young Person of the Year - North Sydney Community Award (Trent Zimmerman’s Office). With the knowledge that Northside Produce Markets were so successful Sophia booked a space at Mosman Market for 2 June, 2018. Unfortunately due to high winds/bad weather the Market was closed. Sophia was to share a table with Boomerang Alliance. 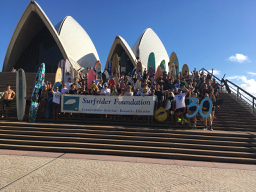 Through Surfrider Foundation Australia the petition was circulated at the Dee Why PCYC Club on 5 June. They showed a screening of Blue to over 200 people. Evening was hosted by Dr Michelle Blewitt, AUSMAP Program Manager, Total Environment Centre. Sophia was able to solicit signatures from attendees at a Willoughby Council sponsored event called TECHSHIFT on the 15 June. The theme was around resource recovery and turning waste into resource. A soft launch of Bye Bye Plastic campaign also occurred. Sophia met Tim Silverwood Co Founder & CEO Take 3 and Katrina Kimmorley, Co Founder Pollinate Energy. At the Laudato Si 6pm youth mass held at St Mary’s North Sydney on 17 June, Sophia spoke to the congregation about how Laudato Si inspired her to organise a petition to Ban the Plastic Bag in NSW. The celebrant, Fr Daven Day SJ endorsed her petition and mass goers had an opportunity to sign after mass. North Sydney Council are producing an online July newsletter which is to have an article about Sophia and her campaign to Ban the Plastic Bag including her petition. Through a Surfrider contact, Australian Geographic (AG) interviewed Sophia for an online article published 22 June, 2018. Australian Geographic has a reach of over 500,000 readers. AG suggested that Sophia be a suitable nomination for AG Young Conservationist of the Year. On the fourth Saturday of each month, The Green Street Collective Ethical Market have a pop up store at 15 Green Street Brookvale. Upon request the organisers agreed to allow Sophia to collect signatures for her petition. Sophia and her Mum met with the supportive owners, Melissa Gray and Rachel Pines. One of the signatures collected was from a Wenona teacher, Rebecca Rodgerson. She asked Sophia to contact her and discuss possibilities for both school communities (Wenona and Monte) to be involved jointly in environmental initiatives. Sophia was accepted as a nomination for Australian Geographic Young Conservationist of the Year with application lodged on 27 June. Referee testimonial was from Surfrider Foundation Australia. Sophia and her Mum met the NSW Premier, Gladys Berejiklian on Friday 4 May at her local office in Naremburn. Gladys is Sophia’s local member. Whilst the Premier was cordial and friendly she was only going to acknowledge the signatures by a letter. Sophia had only obtained 7,040 signatures at this stage. Sophia also offered to meet the Premier on a regular basis to be a youth advocate for Environmental issues especially regarding plastic. The Premier advised that she was time poor and that a quarterly meeting with her was feasible. The Premier also said that if Sophia undertook these initiatives in her electorate that she would include Sophia in her media profile. As soon as Sophia left the Premier’s office she decided that she would get the additional signatures and meet back with the Premier when she did. Sophia emailed the Premier’s office on Monday and updated her on that basis. Also the Premier advised that Sophia needed to copy the signatures and keep the copies. Willoughby Local Council was contacted and Sophia’s Mum attended a breakfast called ‘Willoughby a Green City’ that was being organised by the Council on 15 May. A contact there provided some active organisations that would support the petition including the Surfrider Foundation Australia. Sophia emailed Rowan Hanley and Rowan emailed Surfrider Foundation supporters. Sophia lodged an application for UNICEF Australia Young Ambassador. Late May Sophia was allowed to circulate her petition at House Plays, a major event at Monte which includes all school years. She obtained about 500 signatures. In the morning she attended Muffins with Francis at Mary MacKillop Place as they were discussing Laudato Si’. She was asked to speak at the session about her petition and her experience. Luke Foley, former Leader of the NSW Opposition mailed a letter supporting the petition and he advised that regardless of the number of signatures that he would be pleased to formally table the petition. Sophia emailed back advising that she was meeting the Premier in early May and would update him after the meeting with the Premier. During April an organisation called Compost-A-Pak was contacted. Compost-A-Pak are a Newcastle based family business (for more than 10 years) providing online compostable bags and liners including dog waste solutions. All their products are made from a natural starch-based polymer derived from corn. It is third grade corn so the corn is not suitable for human or animal consumption. Compost-A-Pak mailed some free samples of their products to give/show the NSW Premier when Sophia had her meeting with her. In March 2018 Catholic Weekly contacted Sophia and asked if they could do an article. She agreed and a positive article was included in the Weekly on the 18 March, 2018. The article advised that she had gathered over 1,000 signatures. At this stage she also established an email address for her cause so she could be contacted directly. She was at the Earth Hour Breakfast at Riverview and identified other high schools who would be interested in circulating the petition (so forwarded the petition after the breakfast to these schools). Through a contact from the OLOW Environment group she was allowed to be at the opening of the Coal Loader , Picnic on Platform, Waverton and obtained more than 600 signatures from this event. Northside Produce Markets agreed to have her petition there and Sophia canvassed visitors during March and April. This proved very successful with over 1,000 signatures obtained from the Markets. Sophia identified that there were also free screenings of The Plastic Ocean which the event organisers also allowed her to have her petition. The movie is an expose on the impact of plastic on the marine environment. From these screenings Sophia obtained about 400 signatures. With Sophia’s contacts through Jesuit Communications she extended her reach of Catholic schools across the NSW state including Wollongong and Newcastle. The Office of Bishop Umbers saw the article in the Catholic Weekly and Bishop Umbers signed the petition and circulated amongst his colleagues. The aim for gathering signatures for the petition was to have a close off date mid April which coincided with the end of Term 1 for schools. From her experience with the Climate Change petition, Sophia recognised huge support from her generation, Generation Z. So she reached out to environmental leaders at local high schools in the lower North Shore with the petition, in the main they were Catholic schools. Her own school, Monte have been very supportive with over 1,500 signatures obtained from the school. Sophia also included Wenona as the high school is only a couple of blocks away from Monte. Sophia devised a standard email which went out to the schools, including the petition and a two minute movie which explained the background behind the petition. These schools greatly supported the petition. Sophia also approached Northside Produce Markets, North Sydney and asked if she could have her petition at the Markets. In contacting Boomerang Alliance they provided Sophia free of charge Plastic Pollution Graphics and props which she has used to increase her visibility wherever she had a presence for her petition.